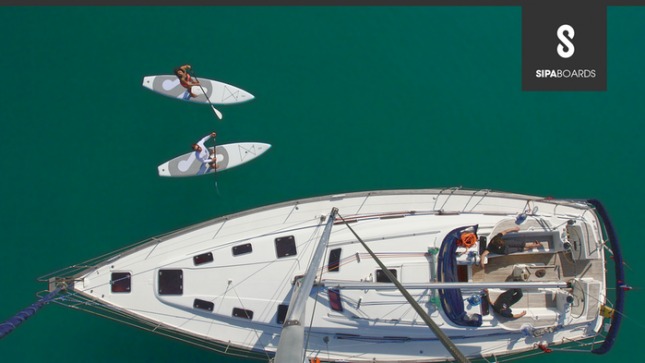 Meet the world’s first self-inflating stand up paddleboard: The SipaBoard. Launched today on Kickstarter by a group of Slovenian entrepreneurs, the Sipa SUP board is probably the most technologically advanced stand up you’ve ever seen. Sipa includes a smorgasbord of technical novelties, however its most unique feature is the “SipaDrive” system. This is the electric motor that powers the self-inflation during setup, before fitting snugly into the center of the deck and acting as a mini little jetski motor to help propel you along out on the water. 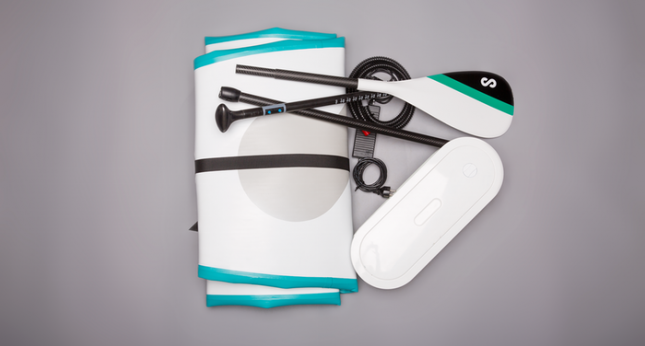 It’s basically a cross between a traditional inflatable SUP board and a Wavejet. There’s also a bluetooth controller on the paddle handle, a companion app and a bunch of other cool stuff that makes this a big leap forward in blow up board technology. Best of all, it’s sporting one of the more stylish designs you’ll come across. The SipaBoard only takes 5 minutes to inflate on its own, which is not only much faster than most people can do it by hand, it’s also a hell of a lot more relaxing. And while some motorised pumps cut out before the board is rigid, leaving the final few pumps to be done by hand, the SipaDrive battery can apparently inflate up to 15 PSI, which is about as stiff and rigid as you’ll ever need from a touring board. 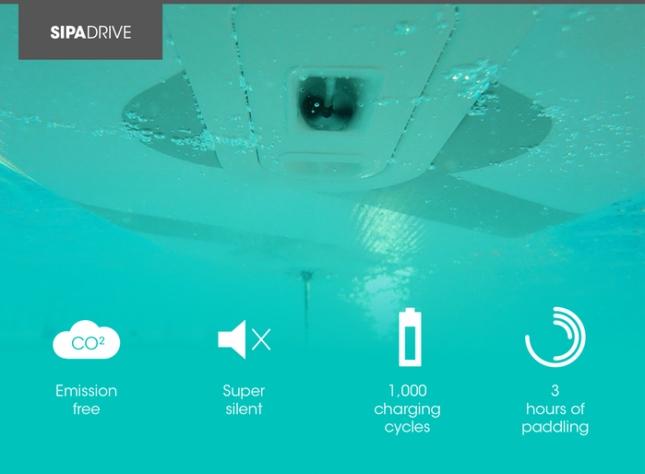 The SipaBoard is 11′ x 31″ @ 240 liters, with the battery lasting for 3 hours out on the water (though you can always just turn it off and paddle like normal). If you want one of these yourself, head on over to the Kickstarter campaign and drop $990 for an early bird model the early bird pledge is sold out / new price is now $1,190 (and that’s about to sell out too). While the idea for a self-inflating stand up paddle board is fairly simple, Sipa is the first to bring it to market as far as I’m aware. Mass production will begin June, with early backers getting their boards in hand by September. Not only is this board extremely novel (and rather useful), the whole Kickstarter page and marketing launch have been produced in a very slick way, so I have no doubt Sipa will reach their goal of $150,000 to fully fund mass production. I’ve got absolutely zero connection to the Sipa gang, I just think this a rad invention that’s worth talking about. Inflatable SUP boards are becoming more and more popular as the technology rapidly advances, and this kind of novel invention can only help push the sport even further into the mainstream.